Zexum high quality Speaker cable. Due to its low impedance, the cable can be run for long lengths without significant loss of quality and clarity. 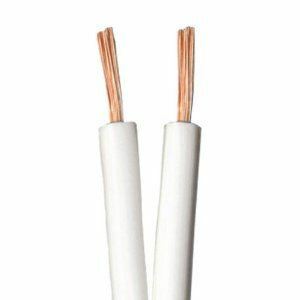 General purpose Speaker cable suitable for use mainly in the wiring of speakers in home entertainment systems, surround sound and car audio. High performance cable which ensures low loss and crystal clear sound. Ideal for multi room installation. A wide range of cable accessories to match this cable - White speaker Cable Clips, 3A Terminal Connector, Gel Crimps.